Proximity to the beach, restaurants and other attractions. Beautiful setting, spacious comfortable rooms. Beach/water is often stormy, and flag is red. Food in the restaurant could definitely be improved - taste and variety. Perfect location: 2 mins to the beach, lots of entertainments and shops at your feet and 20mins casual walk to Old city. Staff was very friendly and ensured parking for us. Spacious rooms, great for long-term family stay (if with small kids especially - there is also kids entertainment area). Nice garden on the path to the beach. The staff was very friendly and helpful. 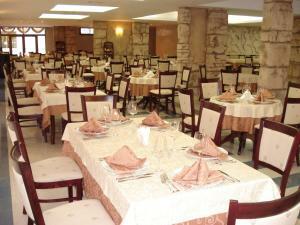 The location is very good, the food was fine and the room was big and clean with everything we needed. Big rooms. Big balkony. Close to the sea and restaurans. Very helpful staff. Location is perfect, very close to the beach. Location and staff were great and really supportive. The hotel is very close to the beach, the rooms are big enough. The location was great near the beach short walk to what we thought a nicer area . Old town . But overall everything on hand I would say uk 3 * but clean and lovely view in back of hotel over the sea. Wouldn’t of wanted a pool side view as loud music at certain times of day . Martinez Aparthotel This rating is a reflection of how the property compares to the industry standard when it comes to price, facilities and services available. It's based on a self-evaluation by the property. Use this rating to help choose your stay! The family-friendly luxury apartment complex is located directly at Harmanite, one of Bulgaria's best beaches, in the coastal resort town of Sozopol, and provides a variety of convenient modern comforts. The stylish Martinez Aparthotel houses contemporary and fashionably designed rooms including elegant furnishings and traditional touches. The building is surrounded with gardens and palm trees creating a tranquil natural environment, ensuring that your stay becomes a relaxing holiday. Hotel Martinez offers accommodations on B&B basis, with possibility of Half board and All Inclusive supplements. All Inclusive includes a tasteful and diverse breakfast, lunch and dinner buffet with variety of Bulgarian and international specialties as well as snack and coffee & cake break with selection of beverages throughout the day. A children's corner is available. This is our guests' favorite part of Sozopol, according to independent reviews. Couples in particular like the location – they rated it 8.1 for a two-person trip. 뀐 Located in the top-rated area in Sozopol, this property has an excellent location score of 8.5! When would you like to stay at Martinez Aparthotel? Private parking is available at a location nearby (reservation is not possible) and charges apply. This apartment features a balcony, kitchenware and satellite TV. Our hotel welcomes you in beautiful spacious apartments located only 20 m from the sandy beach. In our green garden you can enjoy the diverse international cuisine offered by the Rose Garden restaurant only meters from the sea. House Rules Martinez Aparthotel takes special requests – add in the next step! The maximum number of cribs and children allowed in existing beds depends on the room you pick. Double-check the maximum capacity for the room you selected. Martinez Aparthotel accepts these cards and reserves the right to temporarily hold an amount prior to arrival. Please inform the hotel about the exact number of people coming. You can use the Special Requests box when booking or contact the property directly. Please note that children under 7 years can have meals and selected beverages free of charge only if the other guests also choose to add "meals and selected beverages" to the booking. E. g. parents cannot choose the bed and breakfast option and their children under 7 have meals and beverages for free. Please note that the amount of parking places on site is limited. A parking place can not be guaranteed. and it is subject o availability. The pool, which looks very nice from above, was not clean- the floor was green in all the corners. It was very disappointing, but lucky the beach was near and very convenient to walk with the kids. Breakfast. Windows are old, therefore sound isolation was bad. Breakfast was not ok, low-quality food. In the room was a strange smell. Breakfast . Was a free for all Unfriendly residents only Brits here . Music on indoors at breakfast not nessecary. Basic. Quality of food for breakfast was awful. Given that there is plenty of fruit and vegetables in this season in the country it was unbelievable that the offering was that limited. The bath tub was creating a pool in the bathroom after each shower. We were informed that this is because it was badly built. After asking the staff a few times to solve the problem they started giving us tons of towels to put on the floor. Yet, those were not changed every day -we had to ask specifically -and as they were heavily soaked they used to get smelly very quickly. The pool is not tended, many sun beds stay reserved but unused for hours, while there is nowhere to sit. We tried three times to get pool towels and in all cases there were none available. There is a lot of noise around the hotel. The street between the hotel and beach is called ‘the jolly street’ but in fact it is a horrible, smelly, noisy place. We asked for a second key ang after a lot of explanation why we needed it we got it - three days later. Close to the beach, good location for walks to the old town. Spacious, clean rooms. Good WiFi. Bed in the sleeping room was comfy (but not the couch for the kids which was extra hard). Staff is friendly and responsive, although they cannot fix management problems. There was a mole in the apartment, which I believe is not acceptable for 4 stars hotel. We had to pay parking for one night. The bathrooms were not clean, and they did not worked properly. The aircondition did not work in bedroom. If you did not take all inclusive packet, it was hard to get drinks at the pool, even impossible. i had to pay 40 leva because my son put a stain on the bed sheets, i have never had such a experience to get charged for the bed linen! After that we were afraid to sleep just in case we don’t stain the sheets again ! Breakfast very poor, every day the same , no much choice! spacious rooms , near to the beach !! Not a bad place at all , large balcony, friendly reception staff . Somewhat over priced for just BB, no welcome drink/water in the least. Breakfast was ok.
Hedon beach bar and the terrible noise mornings and evenings, yes even at the beach in the afternoons! Horrible!! Also nois level from some of the other restaurants but then only at nights. The weather was badly, that is why we returned earlier than the accommodation period. Breakfast is OK. Could be a little bit better plus there are no labels for the food. The furniture plus tv is a bit old. Very clean though. Staff is very friendly. Location is excellent. Rooms are big enough. Parking lot for free. Perfect for family vacation.